Anticancer and antibiotic agent. Crosslinks DNA. Inhibits DNA synthesis and nuclear division. Also induces apoptosis. Store at +4°C. The product can be stored for up to 12 months. Our Abpromise guarantee covers the use of ab120797 in the following tested applications. Functional Studies Use at an assay dependent concentration. 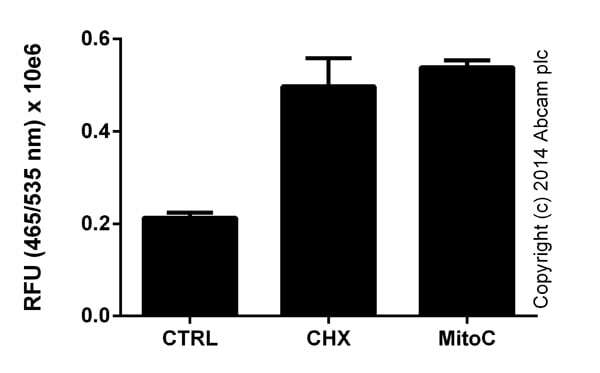 Active caspase 8 in control Jurkat cells (10e6/mL) or cells treated for five hours with 10 ug/mL Cyclohexamide (CHX) (ab120093) or four hours with 25 ug/mL Mitomycin C (MitoC) (ab120797). Background signal subtracted, duplicates; +/- SD. Publishing research using ab120797? Please let us know so that we can cite the reference in this datasheet. There are currently no Customer reviews or Questions for ab120797.